Immerse yourself into 3D videos and photos. Get close to the action and experience your surrounding like never before. Detachable & Replaceable leather Pad keeps your VR glasses clean and brings you more comfortable sense. If dirty, replace it. Much wider and softer than any others?so that the near-sighted can wear own glasses when watching. Larger nose clip space is designed to meet the different facial contours. Humanized design prevents your nose being hurt. You can adjust object distance and pupil distance to satisfy your need. It can discern android & IOS automatically , so there is no android/IOS switch on the side. ADJUSTABLE PUPIL AND FOCUS DISTANCE-----HD aspheric resin optical lens protect your eyes from blue-ray, easy adjustment of pupil distance (PD) and focal distance (FD) bring you enjoyable experience. (Pupil distance can be adjustable in 60-70mm; Focal distance can be adjustable in 44-53mm) It's easy to focus and suitable for 0-600°near-sighted viewing. 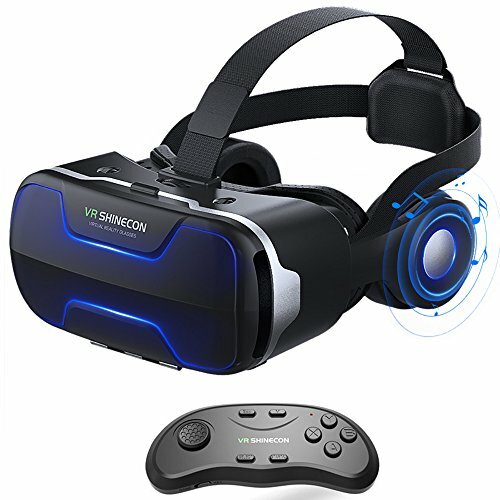 Help you adjust the fuzziness, alleviating the feeling of fatigue, bring you enjoyable virtual reality experience. COMFORTABLE WEARING FEELING-----Ergonomic design T-shaped strap is made of lightweight material, which can decrease the pressure around your eyes, face and your head. This Flexible and adjustable headband is suitable for people of every age, the nose area is deepened, reducing the pressure on your nose. And the leather pad is strong performance of air permeability, it easy remove/attach, deepened nasal bridge portion makes it no paining, provide you a more comfortable feeling. REMOVABLE STEREO HEADPHONES-----The Active Noise Cancelling around-ear headphones from Cobra Tech give you crisp, powerful sound and quiet that helps you enjoy your VR movies, VR games and music better. The softly padded headband allows you to find the perfect fit without constraint and provide excellent durability. And this VR headphone can be removable when you don't need it or replace it with your own headphones;Removable front cover designed for AR user. WIDELY PHONE COMPATIBILITY-----Cobra Tech VR 3D glasses are suitable for smartphones from 4.7 to 6.0 inches, like iPhone X/ 8 / 8 plus/ 7 / 7 Plus/ 6 / 6s/ 6s Plus/ 5/SE / 5s; Samsung S5, S6, S6 edge, S7,S7 edge,S8, Note 4, 5; LG G3, G4, G5, G6, V10, V20; Nexus 5, 6P etc. If you have any questions about this product by Cobra Tech, contact us by completing and submitting the form below. If you are looking for a specif part number, please include it with your message.